Snack Girl is delving into the world of the zero calorie noodle. You heard me, ZERO calories. I just discovered something called Shirataki Noodles that are extremely low calorie, gluten free noodles. Have you heard of these and what is your take on them? Are they a healthy substitute? I'd love to hear your thoughts before trying them myself. The famous shirataki pasta noodles AKA Miracle Noodle are made of a soluble fiber called “glucomannan”. In seven ounces of noodles, you will find ZERO calories. The noodles are edible but they have been processed from a Japanese yam to be INDIGESTABLE so your body extracts no nutrition from them. My first problem with these noodles is the price. For 7 ounces of noodles you pay $2.50 for a bag which is one serving. My entire pound of whole wheat pasta which has calories and nutrition is around $2. Then, there is the preparation which (unfortunately) reminded me of my days working in a science lab. You open the bag and it smells like rotting fish. You rinse the noodles, blanch them in boiling water, and then let them dry on paper towels. Hey, this is a bit nauseating and time consuming! There seemed to be a test at this point that I failed because I had to get them off the paper towels and into marinara sauce without spreading them all over my kitchen counter. Argh. How did they taste? They don’t taste like anything which is what you would expect. They do remind one of pasta, but not enough to convince you that you are eating real pasta. They are far too gelatinous for me. The Miracle Rice is like eating little squid eyeballs (not that I’ve ever eaten squid eyeballs). Now, I know that these noodles have saved people’s diets because they convince you that you are eating zero calorie carbs. I’m just not sure they are worth it but I don't think they are unhealthy. My suggestion is to try cauliflower rice which is easier to prepare, has nutritional value, and costs less per ounce. If you really love noodles, try eating whole wheat pasta in small quantities. At least you get some protein and fiber with your carbs. 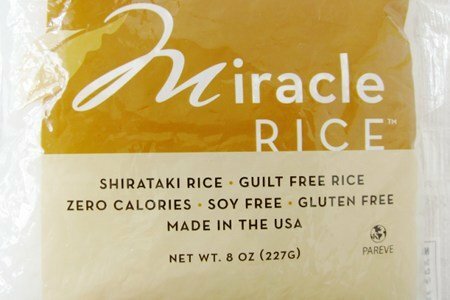 Have any of you tried Miracle noodles? What did you think? Please share. My dad likes to fry them, it makes them do funny things. Horrible! I've tried two times and was horribly naueseas several hours afterward. I had a watery mouth and spent hours over the toilet. I googled "shirataki naueseas" and found many others who react this way to this disgusting noodle. I think I have a reaction to the yam flour. The thought turns my stomach!! I'm with you!! I have tried these, had pretty much the same experience and could never get past the odor that hits you when you open the bag - no matter how much rinsing. Let's face it, we have to learn to eat real food - otherwise, what's the point?? Whole wheat pasta is an absolute gift if you're a pasta eater. The review simply serves to reinforce my position on diet: eat real food that you like, but not so much of it. What is the point in eating something with an unpleasant texture, no flavor, and no nutrition? These are disgusting! Smells awful, slimy. I also tried them twice and had stomach troubles afterwards. If you want to indulge and enjoy a pasta.... Enjoy a small portion of whole wheat (real) pasta. I've never tried the ones you reviewed but I have tried tofu shirataki noodles which are similar because they are a blend of tofu and yam. They do offer some nutritional value and I find they are best when served in Asian inspired dishes. In Italian dishes they never taste good, probably because of the texture. You are right they that are more expensive than regular pasta though and I'm not sure it's worth the extra cost or time involved. agreed -- these are gross! tried them a couple of years ago and could not believe people would actually willingly eat them. ugh! I recently had zucchini noodles at a vegan restaurant, and found them to be delish! I second this type of food isn't natural & intuitive for the body. It's simply food for the mind, satisfying the tongue & making you believe you can eat all you want without calories (which are not really the enemy if you know what they are for). Tricking your liver into waiting for nutrition that never comes is not too healthy (artificial zero cal sweeteners do the same). Plus, although claiming GF, still sounds like glue for the intestines. Thnx for the review! I HAVE A POSITIVE COMMENT. To prepare, wash them in cold water with salt. use your hands. This will get rid if the smell. Then to heat, just add some very hot water and drain. They still have a weird consistency, but will take care of an occasional pasta craving. Try spaghetti squash...when the sauce is on it, it is amazingly tasty. I agree. I bought these twice. The first time I did as directed and thought they were gross! Then I kept seeing how great they were again on a few sites so I bought them again. They sat in my fridge until after there expiration date because I just couldn't bring myself to try them again. I can't get stand the slimy feel. I love wheat pasta and just eat less. I would like to try the cauliflower and zucchini versions though! I tried them once before and had a similar experience. They took a lot of work. I'm not sure I even prepared them properly, but after all I put into them, I wasn't prepared to try it again because after one bite, I spit it out and tossed the rest immediately into the garbage. That is time in my life I will not be getting back! While I'm not fully a fan, I will say that the *tofu* shirataki noodles (which are blended with tofu, I believe) are a little better - a bit firmer, have a bit of a better taste. With cheese, they're not terrible - but I would rather eat whole wheat pasta and figure out a way to cut back elsewhere. I've wanted to try these, but just can't get past the weird texture and smells - even through the bags! I decided that if I want pasta, I do what you suggest, have 2 oz. of whole wheat pasta - tastes like PASTA, has the nice starchy mouthfeel I'm after when I'm craving pasta, etc. And it has nutritional value and requires no gymnastics to prep! Thanks for being our guinea pig, though - you've confirmed what I thought and saved me $ and heartache! thanks for the information. I saw this and I was wondering about this. I am glad I did not spend (waste) the money on these things. Just curious did you ever test the 0 calorie peanut butter product by Walden Farms I want to say? Also the kabocha shots by Celestial Seasonings?? Thank you. I have tried different versions of these and I don't mind them. I have found shortcuts to preparing them and have used them in order dishes. I can't eat pasta either. The processing of grain that results in pasta is really no different than the processing that results in these types of noodles. I agree with you. They're pretty exciting when you first discover them, but not really worth the work. I wonder what the Japanese use them for?